Is there anything more awe-inspiring than watching a whale, the largest creature on earth, gliding through the ocean and breaching, slapping its flukes onto the water? We travel and pay good money to go to sea in hopes of sighting whales. 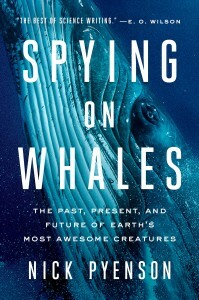 Nick Pyenson’s marvelous Spying on Whales illuminates their majesty. Pyenson is the curator of fossil marine mammals at the Smithsonian’s National Museum of Natural History. His spellbinding narrative (he wanted a book that would be “read, or at least, be readable”) traces whales from the distant past through the present, and into the future. 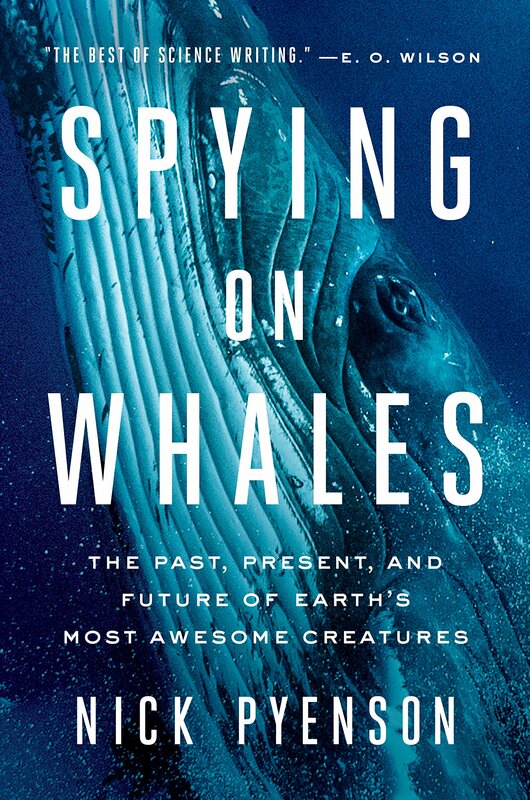 Noting that “the quest to understand whales is a human enterprise,” Pyenson relies on scientists of many disciplines, from “cell biology and acoustics to stratigraphy and parachute physics” to tell their story. Their research is presented in a narrative that mixes the scholarly and the personal, all bringing the story of whales to vivid life. Pyenson recounts his experiences tagging whales and the difficulty of retrieving data. “Whales aren’t my destination; they are the gateway to a journey of discovery across oceans and through time….Whales have a past that reaches into Deep Time, over millions of years, which is important because some features of these past worlds, such as sea level rise and the acidification of ocean water, will return in our near-future one.” In the last fifty million years, for example, whales have evolved from semi-aquatic, four-legged creatures to purely aquatic animals with vestigial hind legs deep within their blubber. He notes that DNA has shown that “hippos are the closest living relatives to whales” while other mammals, such as deer and cows, share a relationship based on the shared existence of multi-chambered stomachs. As a paleontologist, Pyenson focuses on the search for bones. In more than twenty years of searching for and excavating whale fossils, he had found “zero intact skeletons.” Then a colleague called him in to examine a site where land was being removed in order to add more lanes to the Pan American Highway (it came to be known as Cerro Ballena in the Atacama Desert of Chile). Ten intact skeletons of large marine mammals plus other sea creatures were found, measured, and removed for more detailed study. His account of the steps taken to obtain funding, permissions, and equipment for a proper dig while under impossible time constraints beautifully conveys the tension and suspense that he and his colleagues felt. In too many cases scientists are in a race between progress and research. Supplement Pyenson’s riveting account by going to http://cerroballena.si.edu/ for a series of pictures and more detailed information.